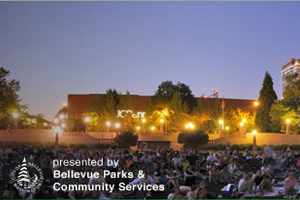 This summer, most nights of the week in the greater Seattle area, you can catch a movie outside with your dog! Grab a blanket or a couple low back chairs, pack a picnic, and go enjoy a feature film this summer! Other: Movies moved to South Bellevue Center in case of inclement weather. South Bellevue Center may not be dog-friendly. Each week a different charity is featured, and moviegoers are encouraged to donate specific items. Get there early for to grab a good seat. Low back chairs recommended! Other: Food trucks on site each week, or bring your own food and drinks! Cirque performers on site for pre-movie entertainment. Get there early for to grab a good seat, as this is a popular event. Seating starts at 7pm and movies are rain or shine. Other: Food trucks on site each week, or bring your own food and drinks! Cirque performers on site for pre-movie entertainment. Local sponsor bars host pre-movie trivia also. Free parking north of fields. Seating starts at 7pm and movies are rain or shine. Other: Food trucks on site each week, and picnic style food allowed inside the event. Get there early for to grab a good seat, as this is a popular event. Seating starts at 7pm and some movies are 21+. Check event website for more details.